Beautiful Flaminia dining room table or desk by Willy Rizzo, chrome, gilded brass, France, 1970s, with transparent glass top. 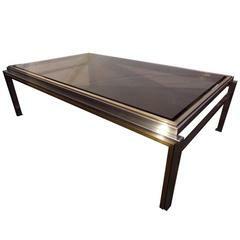 Large Willy Rizzo coffee table, chrome and gilded metal, smoked glass, 1970s. 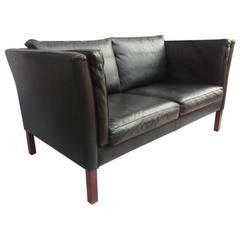 Beautiful two-seat sofa, Scandinavian, 1970s. Black leather. Round dining table in brass and burl by Willy Rizzo for Mario Sabot, 1970s. Wonderfully simplistic parsons style 1970s rectangular dining table. Made of glass, wood and chromed steel legs. Would make for an amazing executive desk or conference table.